Thursday, April 18th at 1:00 p.m. CT.
Join Jim Moran, Verint’s Director of Product Management for a live webinar to hear about our latest video management tool designed to dramatically improve efficiencies around fraud. When an incident occurs, security and fraud investigators must be able to rely on innovative security tools that allow them to swiftly locate and analyze the information needed to determine the proper resolution. Verint Video Investigator is the ideal solution for achieving this level of efficiency. The new video management system simplifies and streamlines fraud investigations and security processes through enhanced functionality, empowering users to make the best use of their time. Get a firsthand look at how the software and hear how this tool can positively impact your branch in several ways. And listen to a live Q&A session with some of the banks across the country using the tool today. Why Video Investigator is right for you. Time savings. Video Investigator reduces the time it takes to access live and recorded video, enabling investigators to rapidly complete investigations and optimizing employee productivity. Increased collaboration. Investigators can quickly and easily share video with multiple stakeholders, including internal or external partners and law enforcement agencies. Enhanced user experience. 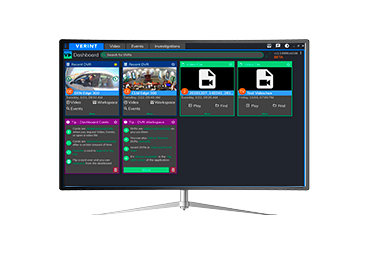 Video Investigator's intuitive, simplified user interface is complete with easy-to-use controls and a modern design, empowering operators to seamlessly perform tasks, make more informed decisions, and align workflow. Reduced training requirements. Banks can avoid complicated and significant training when sharing Video Investigator with new employees, as the solution facilitates a smooth transition for new users, allowing them to get up to speed in minutes and delivering substantial ROI.